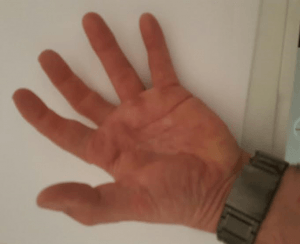 Matthew Salzman is a 33 year old male who experienced an accident at work, resulting in the amputations of the index and middle fingers on his left hand which left only a small portion of his proximal phalanxes. 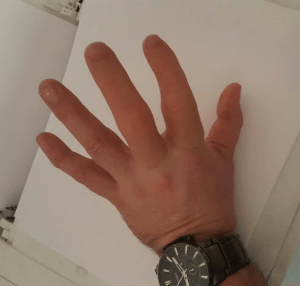 Custom-made silicone finger prostheses are required to restore the hand and bring the patient to an acceptable level of functional rehabilitation. Mr. Salzman’s accident and subsequent amputations have caused difficulties for him physiologically and psychologically. Matthew is a team leader/coordinator at his current job and relies on both his left and right hands to do his job adequately. His responsibility includes helping others on a daily basis as well. Handling objects with his left hand require an awkward and uncomfortable grasping pattern due to the gap in his hand and lack of opposition to his thumb. Matthew is required to wear gloves at work and currently has to cut the fingers of the gloves (the ones that correspond to his amputated fingers) so not to become a safety hazard due to dangling fabric that could potentially be caught in equipment/machines. He is concerned that he will not be able to perform in his job because he feels clumsy and inept. He wants to do well in his job but is also inhibited in his grasp due to the missing fingers. It has been interesting having custom prosthetic fingers made for me. I’m glad that you listened well and regarded my personal input. During the second stage you allowed me to approve your work before going to the next step. 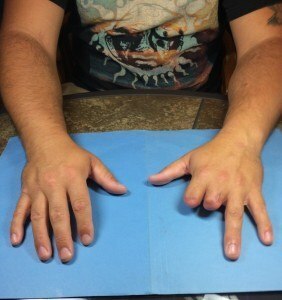 After sending back the molds, I anxiously waited for the prosthetic fingers to be completed. I can honestly say when I received them that I sat and looked at them for hours. They’re so detailed and life-like that close friends and family didn’t notice them for almost a full day. I don’t even remember how many pictures I took of them, but the first pics were to go to you. I have a brief story I would like to share: I am currently in the interview process for the position of police officer. Being that I had an injury that has altered my hand permanently, I have to disclose that in any application that I fill out. Near the end of the first segment of my interview (that portion lasted one hour, forty-five minutes with 8 people!) I was asked by one on the board to explain why I had disclosed that I was missing digits. I said with a smile, “I am, in fact, missing digits…. Two fingers on my left hand.” When the confused looks turned to 100% attention on my hand, I simply removed the prosthetic fingers and showed them that I was indeed missing fingers. All eight people were simply blown away by how detailed they actually were, but more importantly, eight people also never took notice earlier to the fact I was wearing prosthetic fingers. I explained what you did and how they were constructed in another state. They were amazed! I can tell you personally, police officer interviews can be extremely intimidating. You are sized up from head to toe the moment you walk into the room. Believe me, I did not sit on my hands during the interview. I do a great deal of speaking with my hands. The prostheses have given me confidence. Thank you very much for all that your staff has done for me.